On the most above of all we see an official concept art map of Skyrim. It was probably taken of some video clip so it's bit blurry. Some fan has fixed this map (I was going to do my version but there's no need since it has been already done - don't know who I'd credit you otherwise) and can be seen below official. 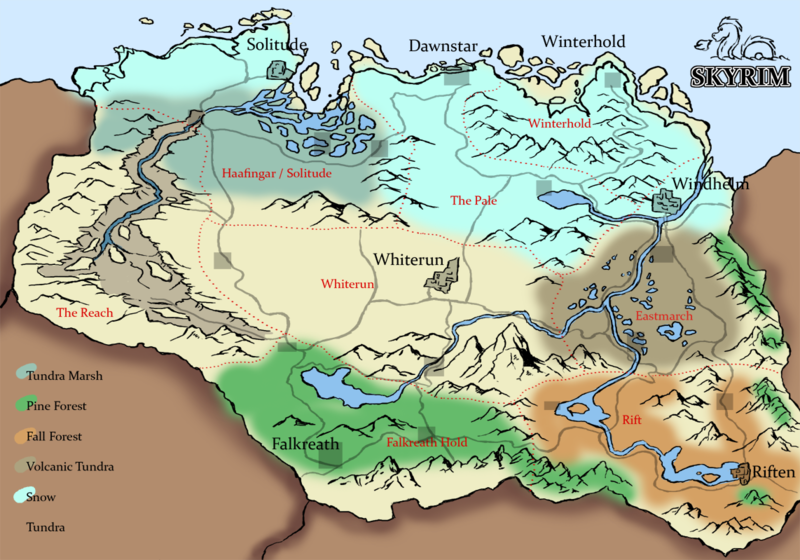 I think it's cool to have more varying areas than in Oblivion which seems to be the case, because in Oblivion there was issues with diversity, areas were like this: "forest 1, forest 2, forest 3, icy mountains, marsh (which wasn't really a marsh anyway)" and that's pretty much it. 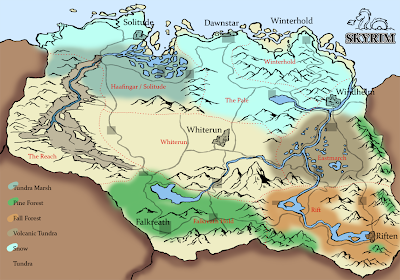 Now we'll have marsh, few types of forest, volcanic earth, snow, tundra. And judging by below images they do vary a bit more this time. Thanks for whoever made the lower map. Keep these areas in mind while checking the below concept art images. 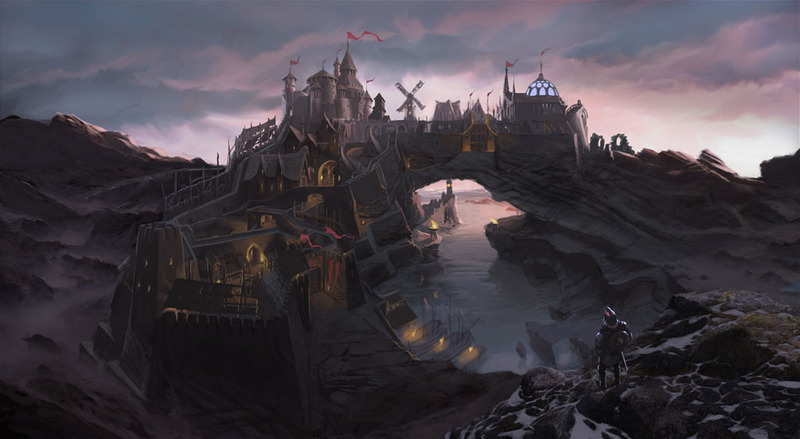 Here we have a highly walled - almost castle-like city on mountain or ridge in cold barren area with most likely northern sea behind it. We see windmills , high roofed houses and docks in there. 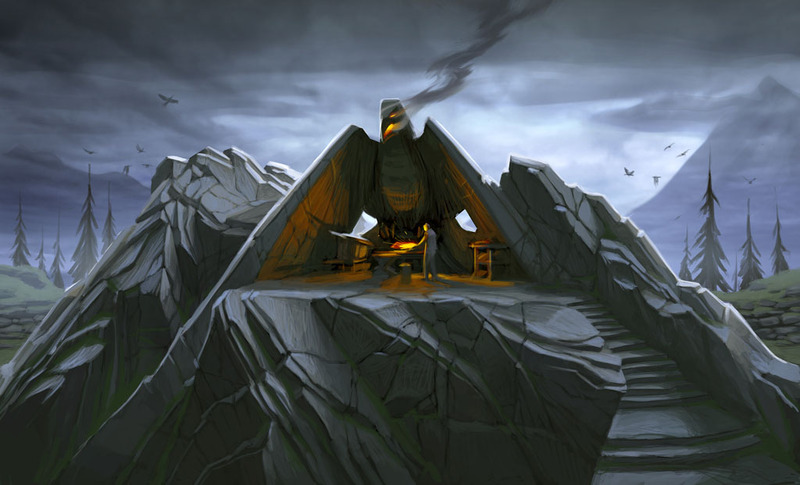 Since it's next to the sea with docks and located in cold area my bet is this is actually concept art for city of Solitude - this is because in the maps we do see that Solitude seems to have sort of a walls drawn in the map so it's most logical. Either that or Winterhold. These could be docks of the same city described above - but could be another docks next to the ocean also: Solitude, Winterhold or even Dawnstar. It's always nice sight seeing huge wooden docks with pirate like ships sailing behind the scenery. 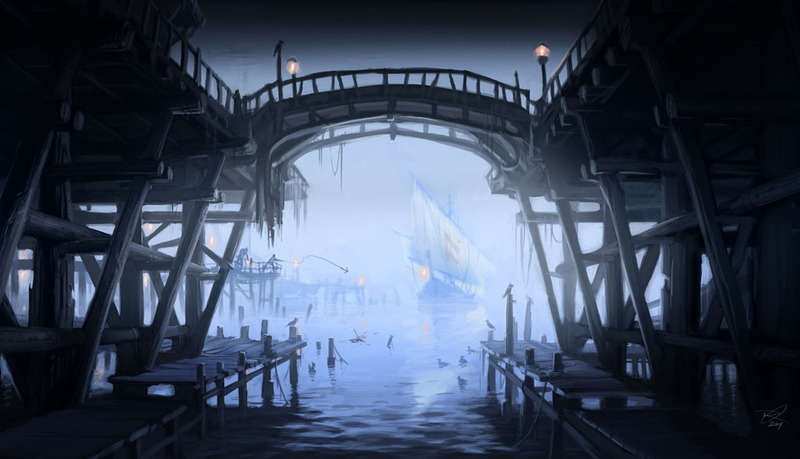 Docks seem two-leveled wooden build here and water and poles are crowded with crows. This one doesn't bring much new to the table. 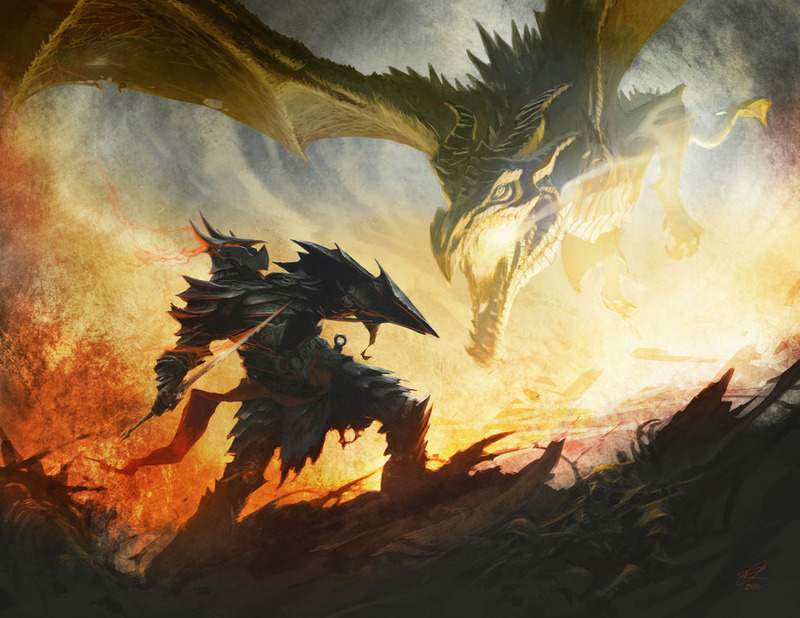 It's heavily armored warrior under dragon attack - but it's a nice concept art anyway. The armor is interesting though - looks like daedric if you ask me. 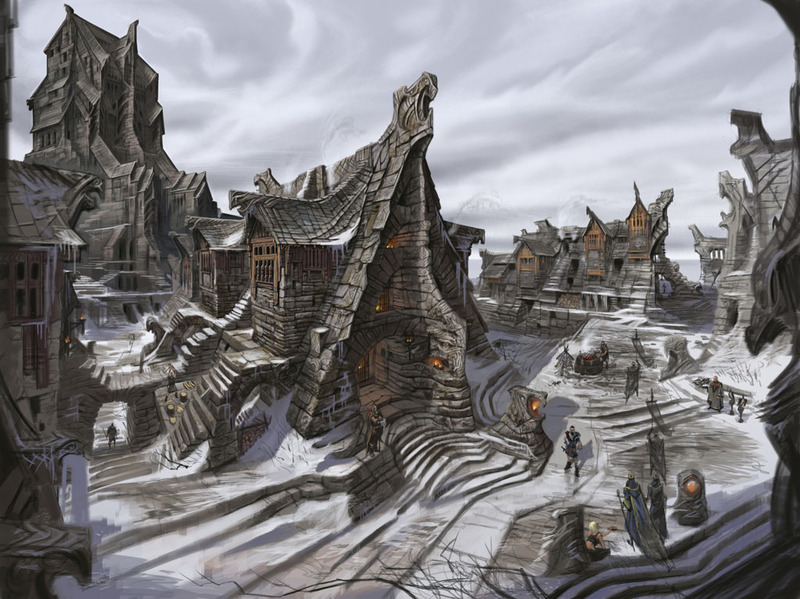 Another cold region concept art next to the ocean. 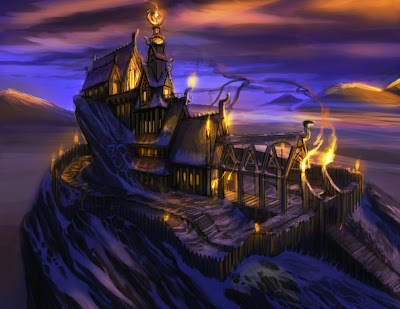 Here we have a mansion of some sort with very nordic style built on the rocks. 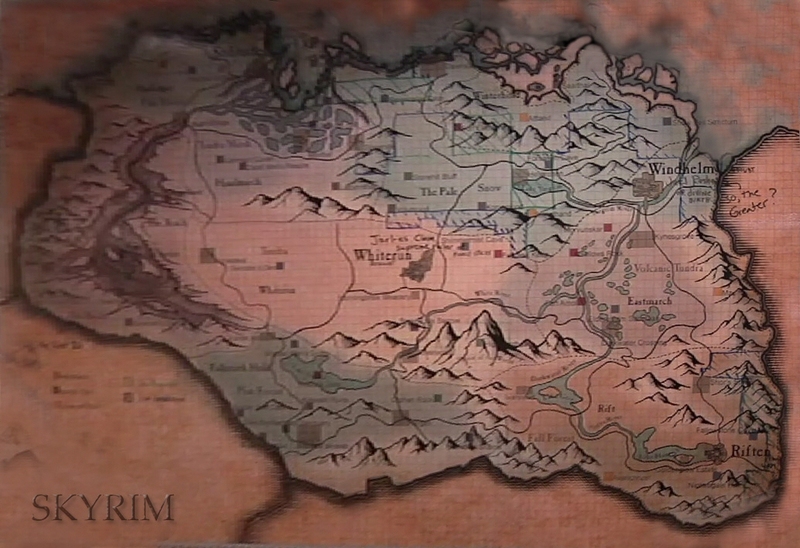 Again it could be located either Solitude, Dawnstar or Winterhold. Wooden walls and high roofs give image fits well in nord theme. More green foresty area with spruces on the background. But I think that's unimportant thing. Smith at the work under some sort of hut build out of eagle statue. Pretty nice theme actually - hope they used this in game. If I had to guess where this area is - well it's on the green with spruces and has large mountain behind - could be on Falkreath? Winter city built with lots of stone! Very innovative - a bit barbaric - building style. Houses seem heavy built, is this Winterhold? Because the name would perfectly describe this city indeed. 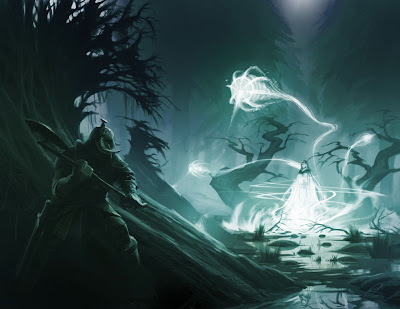 Here we have warrior stalking some sorf of a swamp witch. Very marshy area with some grass and water, dead trees. Probably made for swamp/marsh south of Solitude - this area is called Haafingar? 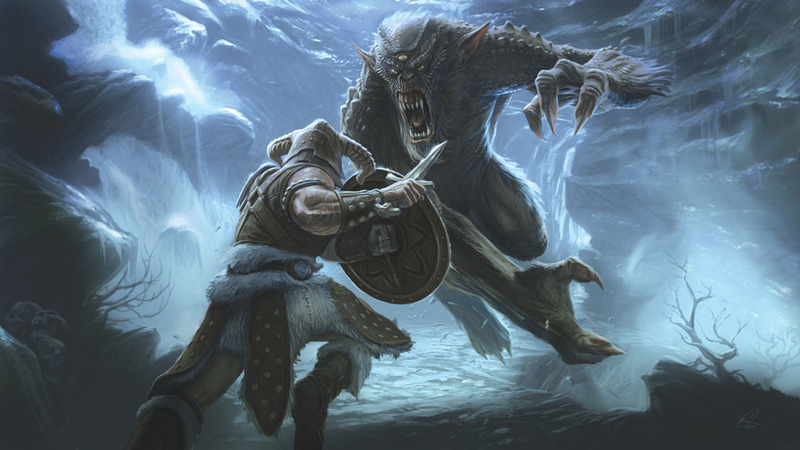 A fight with large troll inside a cave. Studded leather versus troll skin. These creatures really do look big in concept art and way better than in Oblivion - hopefully they were better way executed in-game too. Last one - a small image of sort of a nature monster or a tree monster. 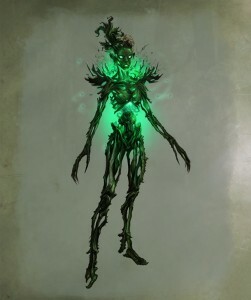 I don't know what these "things" will be called in Skyrim but this looks very much like a Spriggan. You can see these creatures in a video clip of Skyrim released 22nd October too - find it at this blog. Lol gosh, how didn't I remember that - I mean I've played Oblivion quite a bit.. not as much as Daggerfall or Morrowind but.. :-D Oh well, thanks for the info dude.